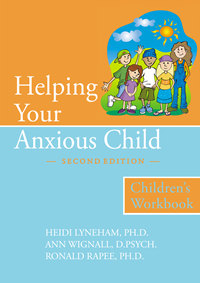 To download the children's workbook referred to in Helping Your Anxious Child, right click the link below and select 'save as'. A password is needed to open the file. The password is the first word of chapter 7 in Helping Your Anxious Child (hint: starts with a capital "L"). Make sure you are using Adobe Reader. Many generic PDF programs cannot cope with password protected files. Save the file to your desktop and then open in Adobe Reader rather than in your browser. If none of these suggestions work please email Heidi.Lyneham@mq.edu.au for further assistance. There is no difference between the downloadable version that you can print at home and the one that we sell (the option is provided purely for convenience).